STORIES OF THE STONE AGE. I.  UGH-LOMI AND UYA. HIS story is of a time beyond the memory of man, before the beginning of history, before the beginning of speech almost, when men still eked out their scarce words by gestures, and talked together as the animals do, by the passing of simple thoughts from mind to mind  being themselves indeed still of the brotherhood of the beasts. Of a time when one might have walked dryshod from France (as we call it now) to England, and when a broad and sluggish Thames flowed through its marshes to meet its father Rhine, flowing through a wide and level country that is under water in these latter days, and which we know by the name of the North Sea. In that remote age the valley which runs along the foot of the Downs did not exist, and the south of Surrey was a range of hills, fir-clad on the middle slopes, and snow-capped the better part of the year. The cores its summits still remain as Leith Hill, and Pitch Hill, and Hindhead. On the lower slopes of the range below the grassy spaces where the wild horses grazed were forests of yew and sweet-chestnut and elm, and the thickets and dark places hid the grizzly bear and the hyæna, and the grey apes clambered through the branches. And still lower amidst the woodland and marsh and open grass along the Wey did this little drama play itself out to the end that I have to tell. Fifty thousand years ago it was, fifty thousand years  if the estimates of the geologists are correct. And in those days the spring-time was as joyful as it is now, and sent the blood coursing in just the same fashion. The afternoon sky was blue with piled white clouds sailing through it, and the south-west wind came like a soft caress. The new-come swallows drove to and fro. The reaches of the river were spangled with white ranunculus, the marshy places were starred with lady's-smock and lit with marsh-mallow wherever the regiments of the sedges lowered their swords, and the northward moving hippopotami, shiny black monsters, sporting clumsily, came floundering and blundering through it all, rejoicing dimly and possessed with one clear idea, to splash the river muddy. Farther up the river and well in sight of the hippopotami, a number of little buff-coloured animals dabbled in the water. There was no fear, no rivalry, and no enmity between them and the hippopotami. As the great bulks came crashing through the reeds and smashed the mirror of the water into silvery splashes, these little creatures shouted and gesticulated with glee. It was the surest sign of high spring. "Boloo!" they cried. "Baayah. Boloo!" They were the children of the men folk, the smoke of whose encampment rose from the knoll at the river's bend. Wild-eyed youngsters they were, with matted hair and little broad-nosed impish faces, covered (as some children are covered even nowadays) with a delicate down of hair. They were narrow in the loins and long in the arms. And their ears had no lobes, and had little pointed tips, a thing that still, in rare instances, survives. Stark-naked vivid little gipsies, as active as monkeys and as full of chatter, though a little wanting in words. Their elders were hidden from the wallowing hippopotami by the crest of the knoll. The human squatting-place was a trampled area among the dead brown fronds of Royal Fern, through which the crosiers of this year's growth were unrolling to tie light and warmth. The fire was a smouldering heap of char, light grey and black, replenished by the old women from time to time with brown leaves. Most of the men were asleep  they slept sitting with their foreheads on their knees. They had killed that morning a good quarry, enough for all, a deer that had been wounded in a rutting fight; so that there had been no quarrelling among them, and some of the women were still gnawing the bones that lay scattered about. Others were making a heap of leaves and sticks to feed Brother Fire when the darkness came again, that he might grow strong and tall therewith, and guard them against the beasts. And two were piling flints that they brought, an armful at a time, from the bend of the river where the children were at play. 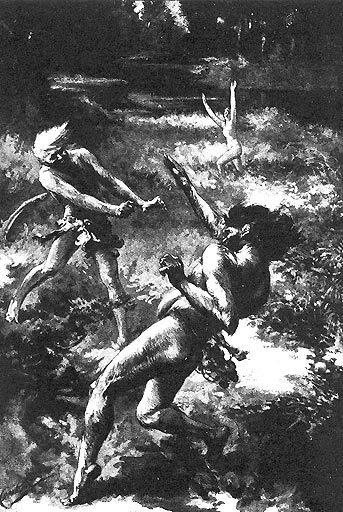 None of these buff-skinned savages were clothed, but some wore about their hips rude girdles of adder-skin or crackling undressed hide, from which depended little bags, not made, but torn from the paws of beasts, and carrying the rudely-dressed flints that were men's chief weapons and tools. And one woman, the mate of Uya the Cunning Man, wore a wonderful necklace of perforated fossils  that others had worn before her. 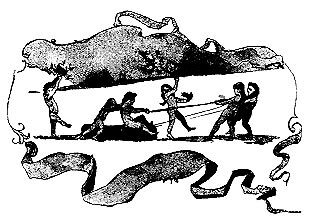 Beside some of the sleeping men lay the big antlers of the elk, with the tines chipped to sharp edges, and long sticks, hacked at the ends with flints into sharp points. There was little else save these things and the smouldering fire to mark these human beings off from the wild animals that ranged the country. But Uya the Cunning did not sleep, but sat with a bone in his hand and scraped busily thereon with a flint, a thing no animal would do. He was the oldest man in the tribe, beetle-browed, prognathous, lank-armed; he had a beard and his cheeks were hairy, and his chest and arms were black with thick hair. And by virtue both of his strength and cunning he was master of the tribe, and his share was always the most and the best. Eudena had hidden herself among the alders, because she was afraid of Uya. She was still a girl, and her eyes were bright and her smile pleasant to see. He had given her a piece of the liver, a man's piece, and a wonderful treat for a girl to get; but as she took it the other woman with the necklace had looked at her, an evil glance, and Ugh-lomi had made a noise in his throat. At that, Uya had looked at him long and steadfastly, and Ugh-lomi's face had fallen. And then Uya had looked at her. She was frightened and she had stolen away, while the feeding was still going on, and Uya was busy with the marrow of a bone. Afterwards he had wandered about as if looking for her. And now she crouched among the alders, wondering mightily what Uya might be doing with the flint and the bone. And Ugh-lomi was not to be seen. He had given her a piece of the liver. Presently a squirrel came leaping through the alders, and she lay so quiet the little man was within six feet of her before he saw her. Whereupon he dashed up a stem in a hurry and began to chatter and scold her. "What are you doing here," he asked, "away from the other men beasts?" "Peace," said Eudena, but he only chattered more, and then she began to break off the little black cones to throw at him. He dodged and defied her, and she grew excited and rose up to throw better, and then she saw Uya coming down the knoll. He had seen the movement of her pale arm amidst the thicket  he was very keen-eyed. At that she forgot the squirrel and set off through the alders and reeds as fast as she could go. She did not care where she went so long as she escaped Uya. She splashed nearly knee-deep through a swampy place, and saw in front of her a slope of ferns  growing more slender and greener as they passed up out of the light into the shade of the young chestnut trees. She was soon amidst the trees  she was very fleet of foot, and she ran on and on, until the forest was old and the trees great, and the vines about their stems where the light came were thick as young trees, and the ropes of ivy stout and tight. On she went, and she doubled and doubled again, and then at last lay down amidst some ferns in a hollow place near a thicket, and listened with her heart beating in her ears. She heard footsteps presently rustling among the dead leaves, far off, and they died away and everything was still again, except the scandalising of the midges  for the evening was drawing on  and the incessant whisper of the leaves. She laughed silently to think the cunning Uya should go by her. She was not frightened. Sometimes, playing with the other girls and lads, she had fled into the wood, though never so far as this. It was pleasant to be hidden and alone. She lay a long time there, glad of her escape, and then she sat up listening. It was a rapid pattering growing louder and coming towards her, and in a little while she could hear grunting noises and the snapping of twigs. It was a drove of the lean grisly wild swine. She turned about her, for a boar is an ill fellow to pass too closely, on account of the sideway slash of his tusks, and she made off slantingly through the trees. But the patter came nearer, they were not feeding as they wandered, but going fast  or else they would not overtake her  and she caught the limb of a tree, swung on to it, and ran up the stem with something of the agility of a monkey. Down below the sharp bristling backs of the swine were already passing when she looked down. And she knew the short, sharp grunts they made meant fear. What were they afraid of? A man? They were in a great hurry for just a man. And then, so suddenly it made her grip on the branch tighten involuntarily, a fawn started in the brake and rushed after the swine. Something else went by, low and grey, with a long body; she did not know what it was, indeed she saw it only momentarily through the interstices of the young leaves; and then there came a pause. She remained stiff and expectant, rigid almost as though she was a part of the tree she clung to, peering down. Then, far away among the trees, clear for a moment, then hidden, then visible knee-deep in ferns, then gone again, ran a man. She knew it was young Ugh-lomi by the fair colour of his hair, and there was red upon his face. Somehow his frantic flight and that scarlet mark made her feel sick. And then nearer, running heavily and breathing hard, came another man also running. At first she could not see, and then she saw, foreshortened and clear to her, Uya, running with great strides and his eyes staring. He was not going after Ugh-lomi. His face was white. It was Uya  afraid! He passed, and was still loud hearing, when something else, something large and with grizzled fur, swinging along with soft swift strides, came rushing in pursuit of him. Eudena suddenly became rigid, ceased to breathe, her clutch convulsive, and her eyes starting. She had never seen the thing before, she did not even see him clearly now, but she knew at once it was the Terror of the Woodshade. His name was a legend, the children would frighten one another, frighten even themselves with his name and run screaming to the squatting place. No man had ever killed any of his kind. Even the mighty mammoth feared his Anger. It was the grizzly bear, the lord of world as the world went then. As he ran he made a continuous growling rumble. "Men in my very lair! Fighting and blood. At the very mouth of my lair. Men, men, men. Fighting and blood." For he was the lord of the wood and of the caves. Long after he had passed she remained, a girl of stone, staring down through the branches. All her power of action had gone from her. She gripped by instinct with hands and knees and feet. It was some time before she could think, and then only one thing was clear in her mind, that the Terror was between her and the tribe  that it would be impossible to descend. Presently when her fear was a little abated she clambered into a more comfortable position, where a great branch forked. The trees rose about her, so that she could see nothing of Brother Fire, who is black by day. Birds began to stir about her, and things that had gone into hiding for fear of her movements crept out. . . .
After a time the blue overhead deepened, and the taller branches flamed out at the touch of the sunset. High overhead the rooks, who were wiser than men, went cawing home to their squatting-places among the elms. Looking down, things were clearer and darker. Eudena thought of going back to the squatting-place ; she let herself down some way, and then the fear of the Terror of the Woodshade came again. While she hesitated a rabbit squealed dismally, and she dared not descend farther. The shadows gathered, and the deeps of the forest began stirring. Eudena went up the tree again to be nearer the light. Down below the shadows came out of their hiding-places and walked abroad. Overhead the blue deepened. A dreadful stillness came, and then the leaves began whispering. Eudena shivered and thought of Brother Fire. The shadows now were gathering in the trees, they sat on the branches and watched her. Branches and leaves were turned to ominous, quiet black shapes that would spring on her if she stirred. Then the white owl, flitting silently, came ghostly through the shades. Darker grew the world and darker, until the leaves and twigs against the sky were black, and the ground was hidden. She remained there all night, an age-long vigil, straining her ears for the things that went on below in the darkness, and keeping motionless lest some stealthy beast should discover her. Man in those days was never alone in the dark, save for such rare accidents as this. Age after age he had learnt the lesson of its terror  a lesson we poor children of his have nowadays painfully to unlearn. Eudena, though in age a woman, was in heart like a little child. She kept as still, poor little animal, as a hare before it is started. The stars gathered and watched her  her one grain of comfort. In one bright one she fancied there was something like Ugh-lomi. Then she fancied it was Ugh-lomi. And near him, red and duller, was Uya, and as the night passed Ugh-lomi fled before him up the sky. She tried to see Brother Fire, who guarded the squatting-place from beasts, but he was not in sight. And far away she heard the mammoths trumpeting as they went down to the drinking-place, and once some huge bulk with heavy paces hurried along, making a noise like a calf, but what it was she could not see. But she thought from the voice it was Yaaa the rhinoceros, who stabs with his nose, goes always alone, and rages without cause. At last the little stars began to hide, and then the larger ones. It was like all the animals vanishing before the Terror. The Sun was coming, lord of the sky, as the grizzly was lord of the forest. Eudena wondered what would happen if one star stayed behind. And then the sky paled to the dawn. When the daylight came the fear of lurking things passed, and she could descend. She was stiff, but not so stiff as you would have been, dear young lady (by virtue of your upbringing), and as she had not been trained to eat at least once in three hours, but instead had often fasted three days, she did not feel uncomfortably hungry. She crept down the tree very cautiously, and went her way stealthily through the wood, and not a squirrel sprang or deer started but the terror of the grizzly bear froze her marrow. Her desire was now to find her people again. Her dread of Uya the Cunning was consumed by a greater dread of loneliness. But she had lost her direction. She had run heedlessly overnight, and she could not tell whether the squatting-place was sunward or where it lay. Ever and again she stopped and listened, and at last, very far away, she heard a measured chinking. It was so faint even in the morning stillness that she could tell it must be far away. But she knew the sound was that of a man sharpening a flint. Presently the trees began to thin out, and then came a regiment of nettles barring the way. She turned aside, and then she came to a fallen tree that she knew, with a noise of bees about it. And so presently she was in sight of the knoll, very far off, and the river under it, and the children and the hippopotami just as they had been yesterday, and the thin spire of smoke swaying in the morning breeze. Far away by the river was the cluster of alders where she had hidden. And at the sight of that the fear of Uya returned, and she crept into a thicket of bracken, out of which a rabbit scuttled, and lay awhile to watch the squatting-place. The men were mostly out of sight, saving Wau, the flint-chiipper; and at that she felt safer. They were away hunting  food, no doubt. Some of the women, too, were down in the stream, stooping intent, seeking mussels, crayfish, and water-snails, and at the sight of their occupation Eudena felt hungry. She rose, and ran through the fern, designing to join them. As she went she heard a voice among the bracken calling softly. She stopped. Then suddenly she heard a rustle behind her, and turning, saw Ugh-lomi rising out of the fern. There were streaks of brown blood and dirt on his face, and his eyes were fierce, and the white stone of Uya, the white Fire Stone, that none but Uya dared to touch, was in his hand. In a stride he was beside her and gripped her arm. He swung her about, and thrust her before him towards the woods. "Uya," he said, and waved his arms about. She heard a cry, looked back, and saw all the women standing up, and two wading out of the stream. Then came a nearer howling, and the old woman with the beard, who watched the fire on the knoll, was waving her arms, and Wau, the man who had been chipping the flint, was getting to his feet. The little children too were hurrying and shouting. "Come!" said Ugh-lomi, and dragged her by the arm. She still did not understand. "Uya," said Ugh-lomi, and she glanced back again at the screaming curve of figures, and dimly understood. Wau and all the women and children were coming towards them, a scattered array of buff shock-headed figures, howling, leaping, and crying. Over the knoll two youths hurried. Down among the ferns to the right came a man, heading them off from the wood. Ugh-lomi left her arm, and the two began running side by side, leaping the bracken and stepping clear and wide. Eudena, knowing her fleetness and the fleetness of Ugh-lomi, laughed aloud at the unequal chase. They were an exceptionally straight-limbed couple for those days. They soon cleared the open, and drew near the wood of chestnut trees again  neither afraid now because neither was alone. They slackened their pace, already not excessive. And suddenly Eudena cried and swerved aside, pointing, and looking up through the tree-stems. Ugh-lomi saw the feet and legs of men running towards him. Eudena was already running off at a tangent. And as he too turned to follow her they heard the voice of Uya coming through the trees, and roaring out his rage at them. Then terror came in their hearts, not the terror that numbs, but the terror that makes one silent and swift. They were cut off now on two sides. They were in a sort of corner of pursuit. On the right hand, and near by them, came the men swift and heavy, with bearded Uya, antler in hand, leading them; and on the left, scattered as one scatters corn, yellow dashes among the fern and grass, ran Wau and the women; and even the little children from the shallow had joined the chase. The two parties converged upon them. Off they went, with Eudena ahead. They knew there was no mercy for them. There was no hunting so sweet to these ancient men as the hunting of men. Once the fierce passion of the chase was lit, the feeble beginnings of humanity in them were thrown to the winds. And Uya in the night had marked Ugh-lomi with the death word. Ugh-lomi was the day's quarry. They ran straight  it was their only chance  taking whatever ground came in the way  a spread of stinging nettles, an open glade, a clump of grass out of which a hyæna fled snarling. Then woods again, long stretches of shady leaf-mould and moss under the green trunks. Then a stiff slope, tree-clad, and long vistas of trees, a glade, a succulent green area of black mud, a wide open space again, and then a clump of lacerating brambles, with beast tracks through it. Behind them the chase trailed out and scattered, with Uya ever at their heels. Eudena kept the first place, running light and with her breath easy, for Ugh-lomi carried the Fire Stone in his hand. It told on his pace  not at first, but after a time. His footsteps behind her suddenly grew remote. Glancing over her shoulder as they crossed another open space, Eudena saw that Ugh-lomi was many yards behind her, and Uya close upon him, with antler already raised in the air to strike him down. Wau and the others were but just emerging from the shadow of the woods. Seeing Ugh-lomi in peril, Eudena ran sideways, looking back, threw up her arms and cried aloud, just as the antler flew. And young Ugh-lomi, expecting this and understanding her cry, ducked his head, so that the missile merely struck his scalp lightly, making but a trivial wound, and flew over him. He turned forthwith, the quartzite Fire Stone in both hands, and hurled it straight at Uya's body as he ran loose from the throw. Uya shouted, but could not dodge it. It took him under the ribs, heavy and flat, and he reeled and went down without a cry. Ugh-lomi caught up the antler  one tine of, it was tipped with his own blood  and came running on again with a red trickle just coming out of his hair. It took him under the ribs, heavy and flat. Uya rolled over twice, and lay a moment before he got up, and then he did not run fast. The colour of his face was changed. Wau overtook him, and then others, and he coughed and laboured in his breath. But he kept on. At last the two fugitives gained the bank of the river, where the stream ran deep and narrow, and they still had fifty yards in hand of Wau, the foremost pursuer, the man who made the smiting stones. He carried one, a large flint, the shape of an oyster and double the size, chipped to a chisel edge, in either hand. They sprang down the steep bank into the stream, rushed through the water, swam the deep current in two or three strokes, and came out wading again, dripping and refreshed, to clamber up the farther bank. It was undermined, and with willows growing thickly therefrom, so that it needed clambering. And while Eudena was still among the silvery branches and Ugh-lomi still in the water  for the antler had encumbered him  Wau came up against the sky on the opposite bank, and the smiting stone, thrown cunningly, took the side of Eudena's knee. She struggled to the top and fell. They heard the pursuers shout to one another, and Ugh-lomi, climbing to her and moving jerkily to mar Wau's aim, felt the second smiting stone graze his ear, and heard the water splashing below him. Then it was Ugh-lomi, the stripling, proved himself to have come to man's estate. For running on, he found Eudena fell behind, limping, and at that he turned, and crying savagely and with a face terrible with sudden wrath and trickling blood, ran swiftly past her back to the bank, whirling the antler round his head. And Eudena kept on, running stoutly still, though she must needs limp at every step, and the pain was already sharp. So that Wau, rising over the edge and clutching the straight willow branches, saw Ugh-lomi towering over him, gigantic against the blue; saw his whole body swing round, and the grip of his hands upon the antler. The edge of the antler came sweeping through the air, and he saw no more. The water under the osiers whirled and eddied and went crimson six feet down the stream. Uya following, stopped knee-high across the stream, and the man who was swimming turned about. The other men who trailed after  they were none of them very mighty men (for Uya was more cunning than strong, brooking no sturdy rivals)  slackened momentarily at the sight of Ugh-lomi standing there above the willows, bloody and terrible, between them and the halting girl, with the huge antler waving in his hand. It seemed as though he had gone into the water a youth, and come out of it a man full grown. He knew what there was behind him. A broad stretch of grass, and then a thicket, and in that Eudena could hide. That was clear in his mind, though his thinking powers were too feeble to see what should happen thereafter. Uya stood knee-deep, undecided and unarmed. His heavy mouth hung open, showing his canine teeth, and he panted heavily. His side was flushed and bruised under the hair. The other man beside him carried a sharpened stick. The rest of the hunters came up one by one to the top of the bank, hairy, long-armed men clutching flints and sticks. Two ran off along the bank down stream, and then clambered down to the water, where Wau had come to the surface struggling weakly. They gibbered at him without any sane attempt to help, and presently he went under again. Two others threatened Ugh-lomi from the bank. He answered back, shouts, vague insults, gestures. Then Uya, who had been standing hesitating, roared with rage, and whirling his fists came plunging through the water. His followers came splashing after him. Ugh-lomi glanced over his shoulder and found Eudena already vanished into the thicket. He would perhaps have waited for Uya, but Uya preferred to spar in the water below him until the others were beside him. Human tactics in those days, in all serious fighting, were the tactics of the pack. Prey that turned at bay they gathered around and rushed. Ugh-lomi felt the rush coming, and hurling the antler at Uya, turned about and fled. When he halted to look back from the shadow of the thicket, he found only three of his pursuers had followed him across the river, and they were going back again. Uya, with a bleeding mouth, was on the farther side of the stream again, but lower down, and he held his hand to his side. The others were in the river dragging something to shore. For a time at least the chase was intermitted. Ugh-lomi stood watching for a space, and snarled at the sight of Uya. Then he turned and plunged into the thicket. In a minute, Eudena came hastening to join him, and they went on hand in hand. He dimly perceived the pain she suffered from the cut and bruised knee, and chose the easier ways. But they went on all that day, mile after mile, through wood and thicket, until at last they came to the chalk land, open grass with rare woods of beech, and the birch growing near water, and they saw the Wealden mountains nearer, and groups of horses grazing together. They went circumspectly, keeping always near thicket and cover, for this was a strange region  even its ways were strange. Steadily the ground rose, until the chestnut forests spread wide and blue below them, and the Thames marshes shone silvery, high and far. They saw no men, for in those days men were still only just come into this part of the world, and were moving but slowly along the river-ways. Towards evening they came on the river again, but now it ran in a gorge, between high cliffs of white chalk that sometimes overhung it. Down the cliffs was a scrub of birches and there were many birds there. And high up the cliff was a little shelf by a tree, whereon they clambered to pass the night. They had had scarcely any food; it was not the time of year for berries, and they had no time to go aside to snare or waylay. They tramped in a hungry weary silence, gnawing at twigs and leaves. But over the surface of the cliffs were a multitude of snails, and in a bush were the freshly laid eggs of a little bird, and then Ugh-lomi threw at and killed a squirrel in a beech tree, so that at last they fed well. 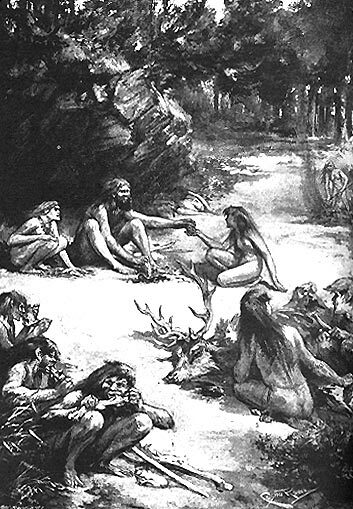 Ugh-lomi watched during the night, his chin on his knees; and he heard young foxes crying hard by, and the noise of mammoths down the gorge, and the hyænas yelling and laughing far away. It was chilly, but they dared not light a fire. Whenever he dozed, his spirit went abroad, and straightway met with the spirit of Uya, and they fought. And always Ugh-lomi was paralysed so that he could not smite nor run, and then he would awake suddenly. Eudena, too, dreamt evil things of Uya, so that they both awoke with the fear of him in their hearts, and by the light of the dawn they saw a woolly rhinoceros go blundering down the valley. During the day they caressed one another and were glad of the sunshine, and Euderia's leg was so stiff she sat on the ledge all day. Ugh-lomi found great flints sticking out of the cliff face, greater than any he had seen, and he dragged some to the ledge and began chipping, so as to be armed against Uya when he came again. And at one he laughed heartily, and Eudena laughed, and they threw it about in derision. It had a hole in it. They stuck their fingers through it, it was very funny indeed. Then they peeped at one another through it. Afterwards, Ugh-lomi got himself a stick, and thrusting by chance at this foolish flint, the stick went in and stuck there. He had rammed it in too tightly to withdraw it. That was still stranger  scarcely funny, terrible almost, and for a time Ugh-lomi did not greatly care to touch the thing. It was as if the flint had bit and held with its teeth. But then he got familiar with the odd combination. He swung it about, and perceived dimly that the stick with the heavy stone on the end struck a better blow than anything he knew. He went to and fro swinging it, and striking with it; but later he tired of it and threw it aside. In the afternoon he went up over the brow of the white cliff, and lay watching by a rabbit-warren until the rabbits came out to play. There were no men thereabouts, and the rabbits were heedless. He threw a smiting stone he had made and got a kill. That night they made a fire from flint sparks and bracken fronds, and talked and caressed by it. And in their sleep Uya's spirit came again, and suddenly, while Ugh-lomi was trying to fight vainly, the foolish flint on the stick came into his hand, and struck Uya with it, and behold! it killed him. But afterwards came other dreams of Uya  for spirits take a lot of killing, and he had to be killed again' Then after that the stone would not keep on the stick. He awoke tired and rather gloomy, and was sulky all the forenoon, in spite of Eudena's kindliness, and instead of hunting he sat chipping a sharp edge to the singular flint, and looking strangely at her. Then he bound the perforated flint on to the stick with strips of rabbit And afterwards he walked up and down the ledge, striking with it, and muttering to himself, and thinking of Uya. It felt very fine and heavy in the hand. Several days, more than there was any counting in those days, five days, it may be, or six, did Ugh-lomi and Eudena stay on that shelf in the gorge of the river, and they lost all fear of men, and their fire burnt redly of a night. And they were very merry together; there was food every day, sweet water, and no enemies. Eudena's knee was well in a couple of days, for those ancient savages had quick-healing flesh. Indeed, they were very happy. On one of those days, although it has little to do with this story, Ugh-lomi dropped a chunk of flint on the cliff. He saw it fall, and go bounding across the river bank into the river, and after laughing and thinking it over a little he tried another. This smashed a bush of hazel in the most interesting way. They spent all the morning dropping stones from the ledge and in the afternoon they discovered this new and interesting pastime was also possible from the cliff brow. The next day they had forgotten this delight. Or at least, it seemed they had forgotten. But Uya came in dreams to spoil the paradise. Three nights he came fighting Ugh-lomi. In the morning after these dreams Ugh-lomi would walk up and down, threatening him and swinging the axe, and at last came the night after Ugh-lomi brained the otter, and they had feasted. Uya went too far. Ugh-lomi awoke, scowling under his heavy brows, and he took his axe, and extending his hand towards Eudena he bade her wait for him upon the ledge. Then he clambered down the white declivity, glanced up once from the foot of it and flourished his axe, and without looking back again went striding along the river bank until the overhanging cliff at the bend hid him. Two days and nights did Eudena sit alone by the fire on the ledge waiting, and in the night the beasts howled over the cliffs and down the valley, and on the cliff over against her the hunched hyænas prowled black against the sky. But no evil thing came near her save fear. Once, far away, she heard the roaring of a lion, following the horses as they came northward over the grass lands with the spring. All that time she waited  the waiting that is pain. And the third day Ugh-lomi came back, up the river. The plumes of a raven were in his hair. The axe was red-stained, and had long dark hairs upon it, and he carried the necklace that had marked the favourite of Uya in his hand. He walked in the soft places, giving no heed to his trail. Save a raw cut below his jaw there was not a wound upon him. "Uya!" cried Ugh-lomi exultant, and Eudena saw it was well. He put the necklace on Eudena, and they ate and drank together. And after eating he began to rehearse the whole story from the beginning, when Uya had cast his eyes on Eudena, and Uya and Ugh-lomi, fighting in the forest, had been chased by the bear, eking out his scanty words with abundant pantomime, springing to his feet and whirling the stone axe round when it came to the fighting. The last fight was a mighty one, stamping and shouting, and once a blow at the fire that sent a torrent of sparks up into the night. And Eudena sat red in the light of the fire, gloating on him, her face flushed and her eyes shining, and the necklace Uya had made about her neck. It was a splendid time, and the stars that look down on us looked down on her, our ancestor  who has been dead now these fifty thousand years.